Enjoy the same class I-III+ rapids of the Classic Trip in one of our inflatable canoes, that we call "Duckies!" Perfect for ages 12 years and up, enjoy this upgraded way to run the Chattahoochee. 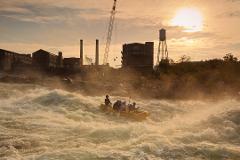 Guests will get to experience the river up close as they ride just inches above the waves. This trip is 2 hours of whitewater fun.